I found this recipe in a Bed and Breakfast cookbook a number of years ago and have been making it for our guests for several years now and it’s always a huge hit. I call it “Mango Melon Soup” as I serve it as a fruit course, one of 3 courses we serve for breakfast each morning at the B&B, but is also a Mango Melon Smoothie as well. This is one of my hubby’s favorites, I always make extra so he can have some too. Enjoy! This recipe and 499 others can be found in our cookbook “Rocky Mountain Lodge & Cabins MORE Favorite Recipes“. It also includes a free e-book version as well. In a blender combine cantaloupe, mangoes, honey, lemon juice, vanilla, and banana (or extract). Blend until smooth. Pour into glasses and garnish with a mint leaf and raspberry. In a blender combine cantaloupe, half of the mangoes (set remainder aside), honey, lemon juice, vanilla, and banana (or extract). Blend until smooth. Refrigerate for several hours to let flavors blend. 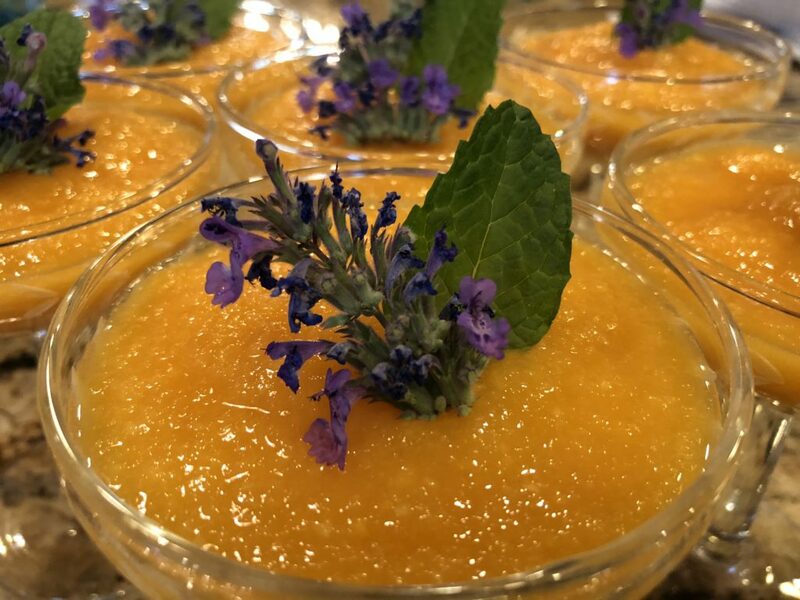 When ready to serve, put remaining mangoes into 12 parfait cups, pour soup over mangoes, and garnish each with a mint leaf and raspberry, or edible flowers.